Environmental pollution with anthropogenic organic compounds is the global problem of our planet. Bioremediation has a great potential to effectively restore polluted environments by using biodegradative activities of microorganisms. 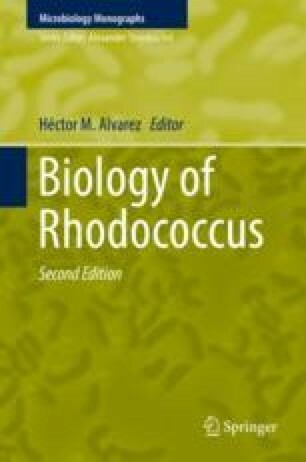 The genus Rhodococcus is a promising group of bacteria suitable for biodegradation of recalcitrant contaminants, such as petroleum hydrocarbons, chlorinated, nitrogenated, and other complex organics. Rhodococcus species are ubiquitous in pristine and contaminated environments, survive under harsh environmental conditions, compete successfully in complex bacterial populations, and therefore could be efficiently used in bioremediation applications. Some success in bioremediation of contaminated soils, waters, and air has been achieved using rhodococci either as bioaugmentation agents or members of indigenous microbial communities stimulated by nutrient and oxygen amendments. Laboratory and field-scale studies on Rhodococcus application in cleanup technologies are reviewed relating to in situ subsurface and groundwater remediation, on-site treatments of contaminated soils, sludges, wastewaters, and gaseous emissions. This research was funded by the Ministry of Science and Higher Education of the Russian Federation (State Task Registration No. 01201353247 for IEGM) and the Russian Science Foundation grant 18-14-00140 for PSU.